The telecommunications industry has advanced in rapid, significant, and unpredictable ways into the twenty-first century. Next Generation Telecommunications Networks, Services, and Management guides the global industry and academia even further by providing an in-depth look at current and developing trends, as well as examining the complex issues of developing, introducing, and managing cutting-edge telecommunications technologies. This book will serve as a contemporary reference for the growing global community of telecommunication and information professionals in industry, government, and academia. It will be important to faculty and graduate students of telecommunications as a graduate textbook. Thomas Plevyak is a past president of the IEEE Communications Society (ComSoc). He is an IEEE Fellow and is currently a Distinguished Member of Technical Staff in Verizon's Network & Technology organization, which is responsible for wireline and wireless operations and network management standards. Dr. Veli Sahin is Senior Director of Business Development at NEC America in Irving, Texas, where he is responsible for NGN, IMS, and IPTV business development, strategic planning, ATIS IIF and MSF standards, and interoperability testing activities. Previously, he held management and leadership positions at Bell Laboratories, Bellcore, Samsung, and Marconi. CHAPTER 1 CHANGES, OPPORTUNITIES, AND CHALLENGES (Veli Sahin and Thomas Plevyak). 1.3 Changes, Opportunities, and Challenges. 1.4 Major Management Challenges for a Value-Added Service: Triple Shift Service. 1.5 The Grand Challenge: System Integration and Interoperability of Disjoined Islands. 1.6 Some Examples of Management System Applications. 1.7 Overview of Book Organization and Chapters. CHAPTER 2 MANAGEMENT OF TRIPLE/QUADRUPLE PLAY SERVICES FROM A TELECOM PERSPECTIVE (Jean Craveur). 2.2 Context of Triple/Quadruple Play for Telecom Operators. 2.3 The Economic, Service, and Commercial Challenges. 2.6 The Customer Experience in Broadband Triple Play. CHAPTER 3 MANAGEMENT OF TRIPLE/QUAD PLAY SERVICES FROM A CABLE PERSPECTIVE (David Jacobs). 3.4 Data over Cable Service Interface Specifi cation (DOCSIS). CHAPTER 4 NEXT GENERATION TECHNOLOGIES, NETWORKS, AND SERVICES (Bhumip Khasnabish). 4.2 Next Generation (NG) Technologies. 4.3 Next Generation Networks (NGNs). 4.5 Management of NG Services. 4.7 Conclusions and Future Works/Trends. CHAPTER 5 IMS AND CONVERGENCE MANAGEMENT (Keizo Kawakami, Kaoru Kenyoshi, and Toshiyuki Misu). 5.3 QoS Control and Authentication. 5.4 Network and Service Management for NGN. CHAPTER 6 NEXT GENERATION OSS ARCHITECTURE (Steve Orobec). 6.2 Why Are Standards Important to OSS Architecture? 6.3 The TeleManagement Forum (TM Forum) for OSS Architecture. 6.5 TM Forum's Enhanced Telecommunications Operations Map (eTOM). 6.7 DMTF CIM (Distributed Task Force Management). 6.8 TIP (TM Forum's Interface Program). 6.9 NGOSS Contracts (aka Business Services). 6.11 Representational State Transfer (REST)—A Silver Bullet? 6.12 Real Network Implementation of a Standard. 6.15 ETSI TISPAN and 3GPP IMS. 6.16 OSS Interaction with IMS and Subscriber Management (SuM). 6.17 NGN OSS Function/Information View Reference Model. 6.19 UML and Domain Specific Languages (DSLs). 6.20 An Emerging Solution: The Domain Specific Language. 6.21 From Model-Driven Architecture to Model-Driven Software Design. 6.22 Other Standards Models (DMTF CIM, 3GPP, and TISPAN). 6.23 Putting Things Together: Business Services in Depth. 6.24 Building a DSL-Based Solution. 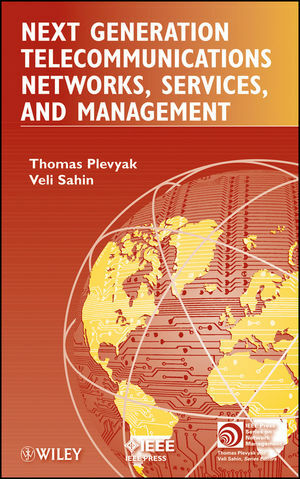 CHAPTER 7 MANAGEMENT OF WIRELESS AD HOC AND SENSOR NETWORKS (Mehmet Ulema). 7.3 Functional and Physical Architectures. CHAPTER 8 STRATEGIC STANDARDS DEVELOPMENT AND NEXT GENERATION MANAGEMENT STANDARDS (Michael Fargano). 8.2 General Standards Development Process. 8.4 Principles, Frameworks, and Architecture in Management Standards. 8.5 Strategic Framework for Management Standards Development. 8.6 Sampling of NGN Management Standards Areas and SDO/Forums. CHAPTER 9 FORECAST OF TELECOMMUNICATIONS NETWORKS AND SERVICES AND THEIR MANAGEMENT (WELL) INTO THE 21ST CENTURY (Roberto Saracco). 9.1 Have We Reached the End of the Road? 9.12 Communication in 2020 (or Quite Sooner).